So…yesterday I had to visit the Homeowner Hell store to pick up a couple tools. I was installing a new dishwasher at the suburban “blah” house (again), and I needed an adjustable wrench and a level. Seems most of my serious “werkin-on-house” tools are at the Old Vic. A quick trip. No muss, no fuss. In and out. Heck, I even made sure I couldn’t stop for that extra stuff like a spare sheet of plywood or a cool roof whirley-gig doom-a-flotcher thingy by taking the motorcycle…and not very many bungee cords. Found the packages of wrenches and a levels right off…they were even in the same section! So far so good…I grabbed what I needed and headed for the checkout. I only looked at the receipt as I headed for the door. The level was a cheap one…a plastic bullet-level with a magnet. Perfect for what I wanted, accurate (I checked it against others on the shelf), and I have good ones…very good ones…at the Old Vic (for some bizarre reason…it’s not like anything is level in a Victorian house). So, yeah, the level was a cheap one. The wrenches? Not so much. “Husky” brand. Lifetime warranty. A three pack. Drop forged and decent quality. On par with the “Craftsman” brand. I had chosen a package of three; a six, eight, and ten-inch wrench. I only needed the one, but at $20 or so, the package of three was a decent deal and I figured to have a set at the “blah” house would be a good thing. I stopped in my tracks and put on my glasses. Damn these old eyes anyway. The level was $4. There was a “CRS” discount on the level for $4. Net, zero. The wrenches rang up the correct item number and description for $6.39. They should have been $21-something as they were marked on the shelf. Occasionally they discount the packages of stuff…but not that far. $21 wasn’t a bad price. $18 would have been a very good deal. Except it was wrong. I couldn’t even by one of these wrenches for that price. Don’t get me wrong…I LOVE a deal…but I don’t want to rip people off either. They need to stay in business so folks have jobs and I can buy the undoubtedly 4.6 million bucks worth of parts and pieces I’ll need over the next few years to whip my buildings into shape. Heck, it’ll take the GDP of a small nation (and about as much labor) just to get all the damn windows done. I turned back to the cashier. She was disinterested but called the senior-head-assistant-to-the-key-grip-sound-advisor (or whatever they call the line-manager). He assured me their scanners were accurate, and even if the price seemed low there wasn’t anything he could do about it anyway. I really think if my store was selling stuff for much less than they paid for it, I could do something…at least follow up to fix it for future sales of the same items…but nobody even made a note of the items. And they’ll wonder why they aren’t making money. 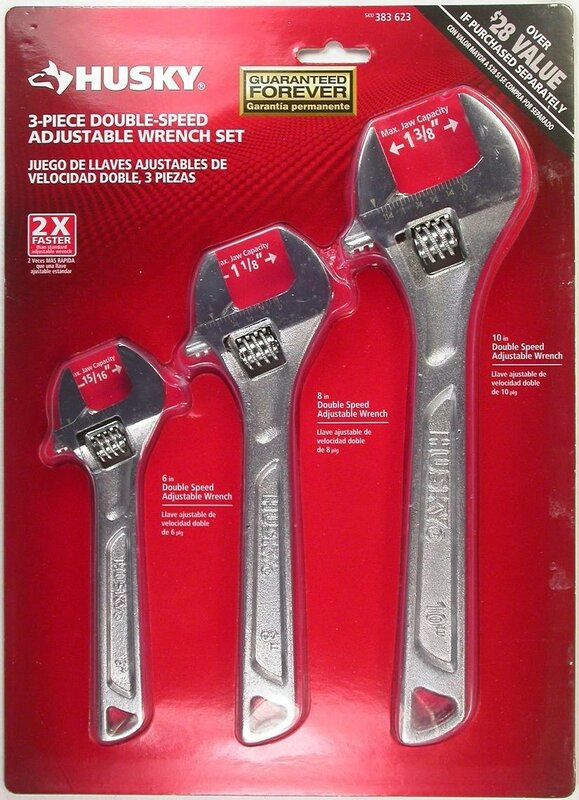 I’m torn…I like my six-dollar wrench set…but hate that they are getting ripped off. Still…it’s a hell of a deal. All my family and friends may be getting adjustable wrench sets and bullet-levels for Christmas! *disclaimer: I have NO idea if they’d ring up at that price for YOU…so DON’T tell them I sent you. I still need to use that store. This entry was posted in Miscellaneous, Tools. Bookmark the permalink.